Intricate detailing, solid wood, gorgeous accents and hand carvings make this an amazing piece of furniture at an amazing price. 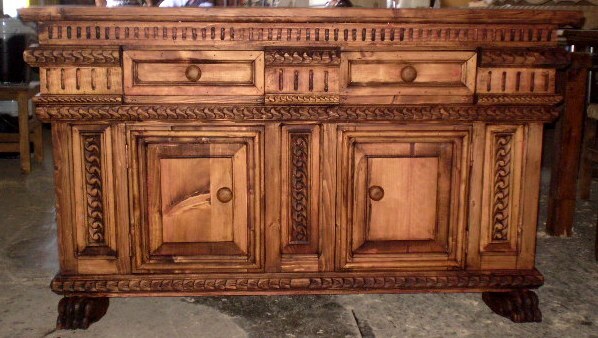 Dazzling intricate detailing, solid wood, gorgeous accents and hand carvings make this buffet an amazing piece of furniture at an amazing price. Two small top drawers for easy storage as well as 2 large drawers. Trust us, you will love this heirloom piece in your Mexican colonial or hacienda home, be it in the living room, office, dining room, or even bedroom. We were thrilled to find this piece of furniture art, and we think you will be thrilled to live with it, build memories with it ... and pass it down as a family heirloom.